To say Ian Campeau has had an epic month is putting it mildly. The founding member of indigenous DJ crew A Tribe Called Red has spun records from the frozen tundra of Iqaluit to the steaming desert of Coachella. But back in his hometown of Ottawa, Campeau experienced a personally momentous moment after being recognized for convincing the Nepean Redskins youth football league to change their name to the Nepean Eagles. "It was unexpected and completely humbling," Campeau, an Anishnabe (Ojibway) of the Nipissing First Nation, tells the Huffington Post Canada. He says the youth role model award he received at the Day of Pink gala is important because "[racist team names] are the most in-your-face socially acceptable systemic oppression within our society and yet it's used by children's football teams. It's not even a gateway drug for racism, it is racism." Campeau began his "change the name" campaign back in 2011, amid growing backlash against indigenous sports team names and mascots that began in the 1960s but gained momentum after the Washington Redskins went to the Super Bowl in 1988 and 1992. The number of native nicknames in school, youth and pro leagues peaked at well over 3,000 across North America. In 2005, the NCAA deemed 18 school names and mascots "hostile or abusive," but only banned the names in postseason games. And while Washington Redskins owner Dan Snyder has remained fiercely opposed ("NEVER—you can use caps.") the team lost their trademark last year due to the "disparaging" name. There has been much more success on a local level. The National Congress of American Indians stated in 2013 that "tribal advocates have succeeded in eliminating over two-thirds of derogatory Indian sports mascots and logos over the past 50 years" with fewer than 1000 remaining. "People are definitely awakening to to the idea of how wrong it is. Slowly but surely the tide seem to have turned within the last three years," Campeau said, admitting he had to have his own awakening, too. "I grew up wearing all of it, Cleveland Indians stuff and Redskin stuff. I latched onto it because it was the only thing within pop culture that represented me. I latched onto it because I never really had much positive role models that represent my demographic." But as a grown-up with his own child, he came to see how dehumanizing it can be. "It's being applied and normalized within society," he said. "All these missing and murdered women, and these fires that are killing people all over the place, we're not seen as human beings right away. We're seen as cartoon characters. So until we're taken seriously and seen as human beings and not these ancient relics or ridiculous stereotypes, we won't be taken seriously for these quote-unquote more important issues. But to me this is of the most utmost importance. "Suicide rates within indigenous communities are the highest in the world," he adds, "so perpetuating this idea of being less worthy is killing our kids." When he first found out about the Nepean Redskins — a name the former Barrhaven Buccaneers chose in 1981 because they shared colours with the Washington team — Campeau fired off an email to the youth league's organizers explaining the situation. He figured that would be that. They never responded. When he took his campaign to their Facebook page, he was met with "extreme hostility." Seeking help from his local city councillor, Jan Harder, also proved a dead-end. "You won't get it from me or anyone else I know," she emailed Campeau. "You are looking for trouble where none exists." 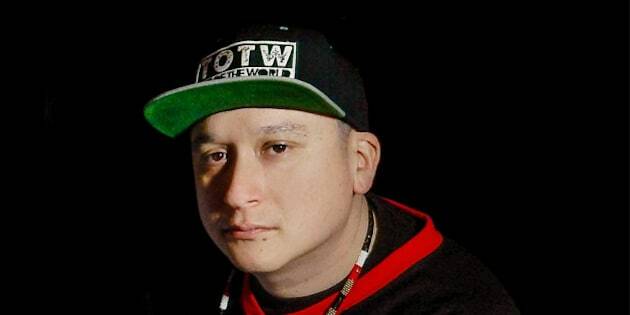 Around this time, however, Campeau's group A Tribe Called Red started getting some buzz, which gave the DJ-activist a social media soapbox he could use to get a conversation happening online to garner support. After all, he says, "you can't tell me it's not racist when it's specifically pointing out the color of someone's skin." "It turned out that I lived within the region where if my daughter wanted to play football, that would be the team that she would play for. The name was being normalized for children her age who lived with in our neighborhood — what's going to stop them from using it on her? The argument that the team had was that they were not teaching kids to use it in a bad way, but my point was that [Redskins] is a bad word no matter how you use it." Filed on Sept. 3, 2013, the human rights complaint sparked a media blitz as the story went from regional to national, garnering coverage on CTV, CBC, the Globe & Mail, National Post and here at HuffPost Canada. It also inspired supportive editorials in cities like Sudbury. After a couple years of obstinately insisting that the name Redskins "was never used in a racial way," management gave in just over two weeks after Campeau's complaint. Team president Steve Dean announced the franchise would change its name, acknowledging "the current name is offensive to some, and thus divisive to our community." Though the human rights controversy pushed his campaign to the finish line, Campeau cites the power of social media as being the driving force behind his success. "Social media is incredibly powerful especially within the indigenous communities. The reserve system is meant to keep us out of sight, out of mind. So now that we have social media we're able to criticize and have a voice on a level platform for the first time," he explained. While also giving credit that his celebrity helped, Campeau says it merely accelerated the process and that others can replicate his success in their own communities. "You don't need thousands of followers to get the job done. [But you do have] to arm yourself with as much knowledge as you can behind your cause. Get to know statistics, find research papers, back up what you're saying. It's really easy to present to a school board or the president of the league if you have the American Psychological Association telling you that these types of sports names are harmful." Campeau notes that pushback — which got quite ugly on social media, talk radio, newspaper columns and Internet comment sections, including an online threat last January after the name change that required informing the police — is all from adults not the young players. "These [kids] don't care the name of their team is going to be the Eagles. This tradition aspect is the only thing that people are holding onto, the only reason why people want to keep names like this. It's obviously the parents." Campeau admits it's easier to convince grassroots local teams to change their names, of which plenty remain across Canada, rather than big money franchises like the Edmonton Eskimos, Washington Redskins or the Cleveland Indians, whose Chief Wahoo-adorned fans faced an angry protest at the home opener earlier this month. "But you can multitask. They're not exclusive, you can challenge the use of native mascots anywhere."